•RivEX can sample each polyline at a fixed position along its length (expressed as a %) or a number of times at random positions. This tool is ideal for generating a point which is linked to each polyline of the network as it intersects the polyline and also includes the ID of the polyline (useful for joining data to the point). •The point is generated by taking each polyline, generating a random number between 0 and 100 or using the user defined % along length and then measuring along the length of the polyline as a ratio of the polyline length. 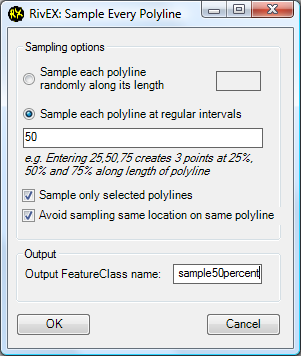 This method guarantees that each polyline will be sampled the number of times entered by the user. If you want to generate random points across the whole network you should be using the Random Sampling tool. •If you have a selection on your network you can choose to process only those polylines by ticking the appropriate check box. This check box becomes active if there is a selection. The avoid sampling at same location check box stops RivEX from generating multiple points at exactly at the same location, this is ticked on as default. •You can specify a point anywhere along a polyline between 0% and 100% of its length for all polylines in a network (or selection). Selecting the regular sampling radio control will enable the text box below. You can type in a single number (must be an integer between 0 and 100) or several numbers separated by commas (note no spaces). In the image below a user has entered the values 25, 50 and 75. RivEX will generate a point at 25%, 50% and 75% along the length of each polyline within the network. •You can generate a point at a random position for each polyline in the network (or selection). Selecting the Random sampling radio control will enable the text box below. Here you type the number of random points you want to generate for each polyline. You also have the option to say do not re-sample the same location by ticking the check box. In the example below the user has asked RivEX to create 3 random points on each polyline of the network.